Anyone can just plainly see the two towers of “Domestic Law Enforcement” and “Interdiction,” that together dwarf the resources to be spent on treatment. 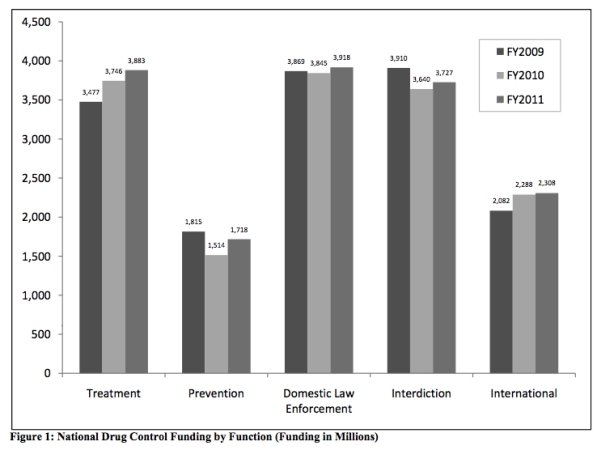 What the drug czar’s office is calling a “Balanced Approach to Drug Control” is so obscenely imbalanced that anybody who knows how to read a bar graph could see it without having to put their contacts in. We’re still spending twice as much on the war as we are on treatment for the actual people our drug policy is supposed to help. The urge to describe this as “balanced” is just the trademark dishonesty we’ve come to expect from the drug czar’s office anytime they’re required to sum up their agenda in one sentence. The whole situation is even more appalling when you consider the phenomenal lengths this administration has taken to convince everyone that their drug policy priorities aren’t like this. I suppose it’s a measure of success for our movement that we’ve at least made it unacceptably controversial for the White House to take any pride in its drug war spending, but that’s still an early stage in the long battle to take interdiction off the table and leave enforcement to the states. If Obama hopes to placate the public’s growing disgust with the drug war status quo, he’ll have to pay much more than lip service to the reform of our drug policy. Everything people hate about the war on drugs must be changed; the swelling prison population, the persecution of the sick, the subsidization of widespread violence, the vast corruption and the perpetual recycling of so many ridiculous lies all must come to an end or else the people refusing to end it will be blamed hard for the damage it keeps causing. The public relations holiday that followed Obama’s improved policy on medical marijuana is officially over and the reluctant support he enjoyed from so many reformers in 2008 will be hard to come by if the drug war is uglier in 2012 than it is today.